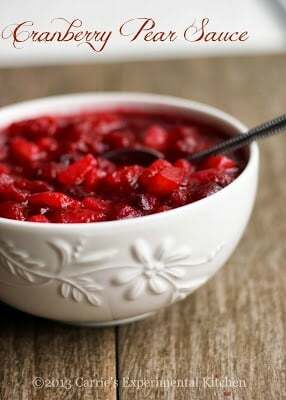 Cranberry Pear Sauce made with fresh cranberries, Bosc pears, white wine, cinnamon and brown sugar is a delightful addition to your Thanksgiving table. Let’s see a show of hands. 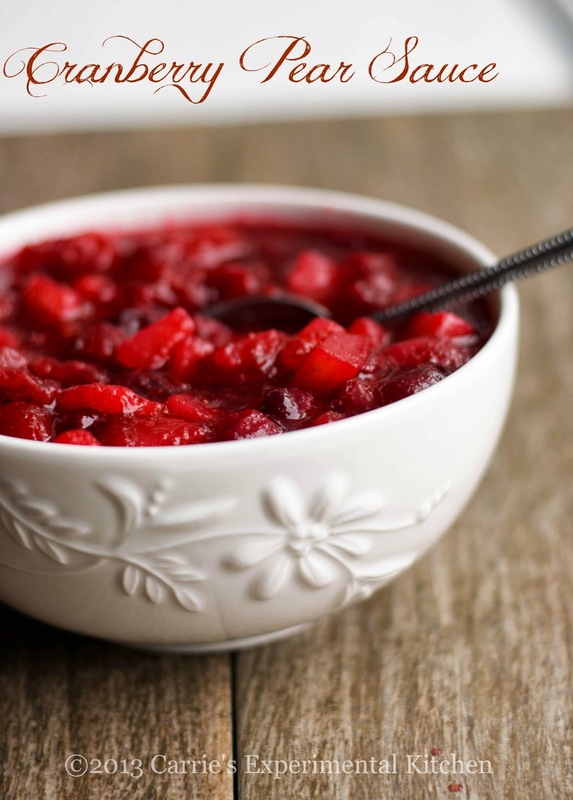 How many people use canned cranberry sauce on Thanksgiving? I always did. It was just what I grew up with and yes, I even liked the jellied version that had to be sliced. (No judgment please! 😉 ). 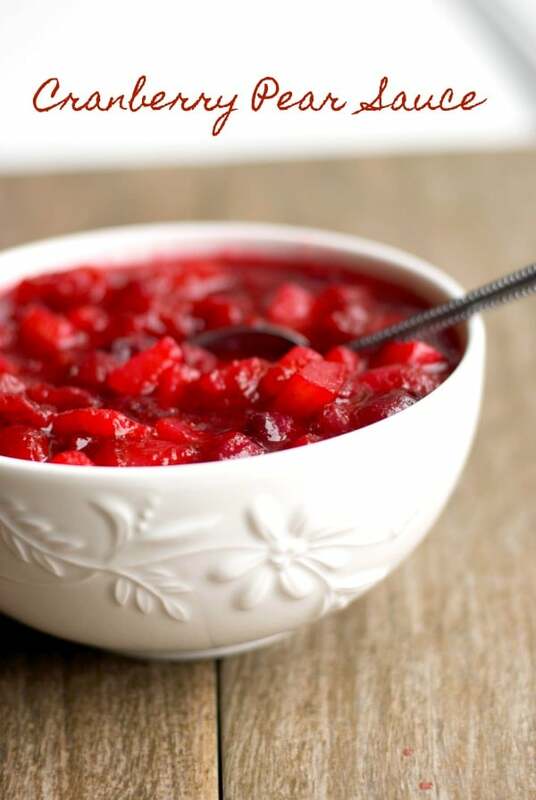 That is until last year when I made my own version of homemade cranberry sauce after seeing how easy it was. 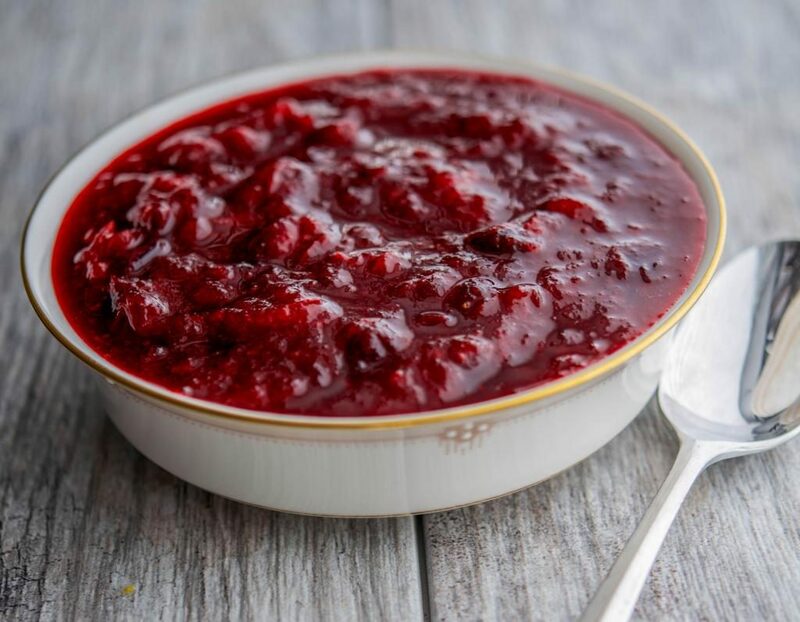 This year, I was ready to experiment with my own recipe and came up with this Cranberry Pear Sauce. I added the pears because I happened to have two laying around and thought it would give the cranberry sauce a nice flavor. It certainly did! 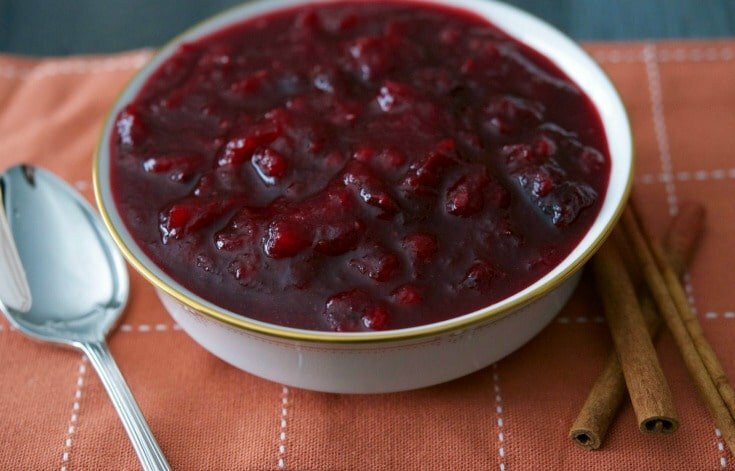 To make this recipe, combine the wine, waterand cinnamon in a medium saucepan over high heat and bring to a boil; then reduce heat and simmer for 15 minutes. Add the cranberries, pears, and sugar to the pan and bring the mixture back up to a boil. Reduce the heat and allow to simmer for an additional 15 minutes. The sauce will be done when the cranberries start to burst open. Remove the sauce from the heat and allow to cool completely before transferring it to a bowl. Keep refrigerated in an airtight container until ready to serve. Can be prepared up to 2 days ahead of time. 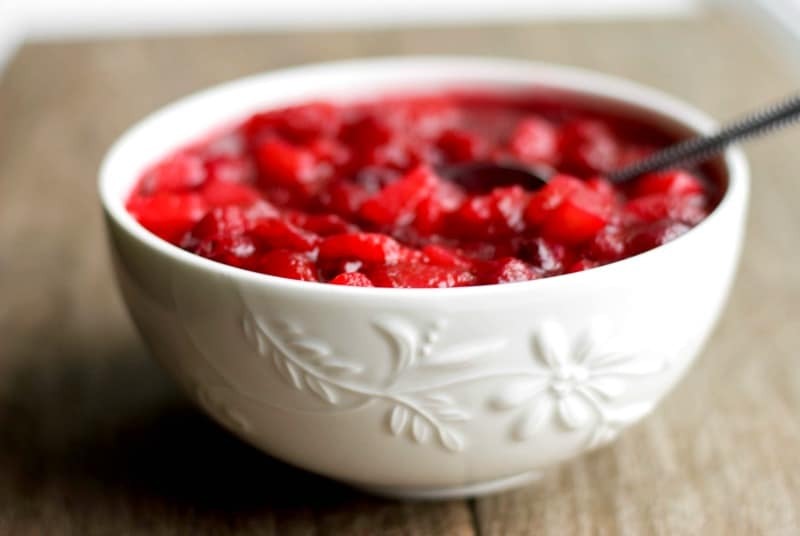 With only five ingredients and a half hour of your time, you can have fresh cranberry sauce on your Thanksgiving table this year too. And I’ll bet you will NEVER go back to the canned stuff again…trust me! ~Enjoy! Combine the wine, water, and cinnamon in a medium saucepan over high heat and bring to a boil; then reduce heat and simmer for 15 minutes. Add the cranberries, pears, and sugar and bring back up to a boil. Reduce heat and allow to simmer for an additional 15 minutes. The sauce will be done when the cranberries start to burst open. 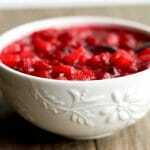 Remove from the heat and allow to cool completely before transferring to a bowl. Keep refrigerated in an airtight container until ready to serve. Can be prepared up to 2 days ahead of time. Could anything else be substituted for the wine? Thank you! I suppose you could just use water or maybe some apple juice or apple cider, though I’ve never tried it that way. Let me know how it turns out! This sounds terrific–though I’ve got 2 open bottles of red wine which I don’t think would be that radical of a departure. My family may applaud the lack of beets. I’ve made another version with red wine and it was just as tasty. I’m sure your family will love this recipe.